These are exciting times for NCTE, and in turn for our affiliates. This weekend I had the energizing experience of spending time at an Affiliate Leadership Meeting like none other before it. For the first time ever, ALL of our 70 affiliates were invited to attend this meeting together instead of our past practice of meeting with half of our affiliates in alternate years. We focused on building leadership capacity within affiliate organizations and unpacking the best practices NCTE is breaking ground on every day. The meeting relayed our new vision and collective mission, and the realities of what works in building membership—with the mantra of belonging, not following. Perhaps most important, this meeting zeroed in on how we can all offer new opportunities for teachers and students nationwide and in our local communities. The result was a compelling and spirited coming together. The knowledge and the camaraderie sparked at this meeting have the potential to ignite and galvanize our affiliates into a period of vitality, an effect that could extend well beyond the hearts and minds of the 111 leaders who attended. I was struck by the realistic resolve of the meeting’s participants, both experienced and emerging leaders, who were all there to grow and modernize services to affiliates. I not only shared but also heard many new ways of thinking about our shared mission, communication, membership, and advocacy. The discussion was targeted and practical and big picture. Indeed, it is what we need to prepare for the future. It’s no mistake that Sharon is a longtime NCTE and affiliate member! The entire NCTE Presidential Team, led by President Susan Houser, was in attendance to guide and listen intently. A longtime affiliate leader and unwavering advocate of our local and state organizations, Susan worked with us to help shape the agenda and set the expectations for the meeting. 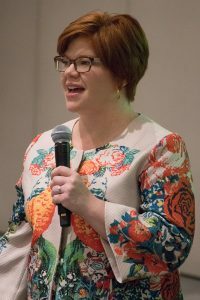 The presentations of expert affiliate and NCTE staff leaders and partners in the areas of communication, advocacy, and intellectual freedom were exemplary. I was honored to present alongside Leila Christenbury, Cathy Fleischer, Shelbie Witte, Sara Kajder, C.C. Chapman, Millie Davis, and so many others who challenged our thinking and provided tangible advice and smart resources and tools. I encourage you to check with us to get more information on the ideas, data, tools, and best practices shared at the meeting and merge it with your inspired teaching, thinking, and networking. There is much more to come as we collectively work to continue the meeting’s conversation and spread its ideas. And we want you to be a part of it whether you were with us in Atlanta or not. We so value the vital leadership and inspiring and practical support affiliates provide for so many teachers and students across North America. Affiliates are a critical lifeline and touchpoint for teachers at the local level, where we stand up for education, students, and the teaching profession each and every day. The action of teachers thinking globally and acting locally just would not be feasible to sustain without affiliate organizations. NCTE will continue working to turn the page with and beside affiliates in new ways as part of our path moving forward.